Medieval Towns and Villages of Veneto, Italy. All about Marostica. Marostica, in Veneto, is part of the inner circle of the minor medieval towns and villages of Italy which have been certified by the prestigious Touring Club Italiano with the so called Bandiera Arancione seal(orange flag). There are some strict requirements to meet to take part in this Touring Club Italiano’s list: having a great historical, cultural and environmental heritage, plus offering high quality incoming travel services. 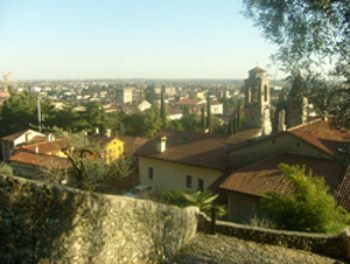 The Veneto's province of Vicenza, being between the top attractions areas of Verona and Venice, it’s often neglected by tourists visiting Veneto who are often short of time and must pick the places to visit. And it’s a pity! 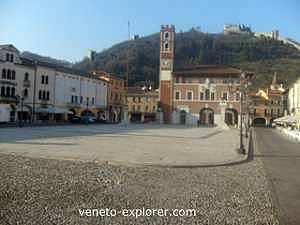 Marostica - pronounced with accent on the o - is really a small town and the only way to enjoy your visit it is by foot. Therefore the best thing is to park your car outside the middle ages castle walls which embrace the historical center. There are many parking lots available. While driving towards the town, you will see in the distance the Pauso hill, crowned all around from the top to the bottom by the ancient circular surrounding crenellated wall, dating back to 1372. The wall is about 2 Km/1,24 miles long, and 8-12 mt/26-40 ft high, with 24 well preserved crenellated towers. This surrounding wall, embracing both the hill and the historical centre, connects the lower castle, at the hamlet level, to the upper castle, located at the top of the hill. Ready to start the visit to Marostica? Please, take my strong advice..wear comfortable shoes, leave home your elegant or high heels shoes, ok? You will find out why soon. 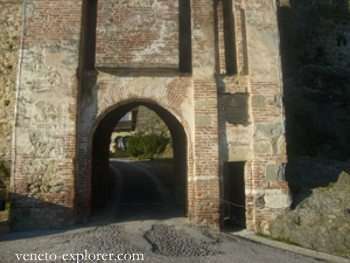 As in many european medieval towns and villages, you enter the old town walking through an ancient gate. In Marostica there are 4 gates, back in the middle ages all having a drawbridge and a spotting tower. 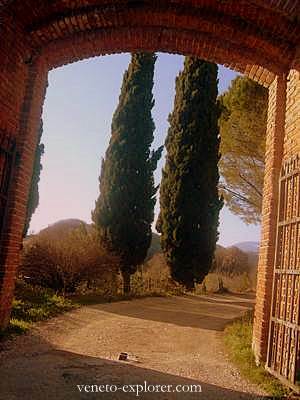 The main gate is called Porta Castello (Castello gate). While you are passing through the gate, you will see before your eyes the famous Piazza degli Scacchi (Chess Board Square), very easily recognizable for the huge white and pinkish chessboard paved with Asiago stone. The Piazza degli Scacchi in Marostica. The Piazza degli scacchi is famous worldwide for the chess game with living pawns (people and horses) taking place every two years in September, and only during even years. It’s about a very suggestive historical reenactment, made with attention to the smallest of details. If you happen to be in Veneto in September of any even year, you might want to not miss this event, that brings back to life the typical atmosphere of the medieval towns and villages, thanks to over 550 walk-ons wearing costumes of the time, colorful gonfalons and ancient music. 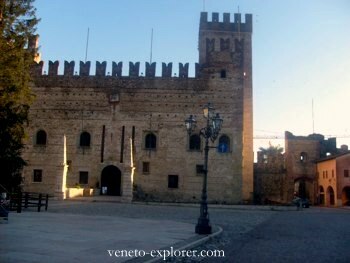 As soon as you enter Porta Castello, you will see on your left the lower castle, which stands out for its majestic keep. It’s a typical example of a military fortress, common in many european medieval towns and villages. After significant damages to the upper manor in 1510, during the Cambrai League war, the local Lord moved here to the lower castle. The Cambrai war is an almost unbelievable event, which shows the huge power and smartness of The Republic of Venice at the time. It was kind of the world war of that time, in which almost all the european major powers - more than 15 Kingdoms against the only Venice- united forces against the powerful Republic in order to prevent it to further expand towards the mainland. And you know what? Venice won the war, and did not lose its mainland territories, included Marostica and the rest of Veneto. Today the lower castle is the seat of the city government.Inside there is a museum with all the costumes worn for the chess game reeanactment, and the weapons from that era. If you like hats, there’s a small museum of straw hats as well... why straw hats? ...The northern province of Vicenza, and mostly Marostica, have been a renowned worldwide producer and exporter of those articles of clothing for about four centuries, up until the second world war. 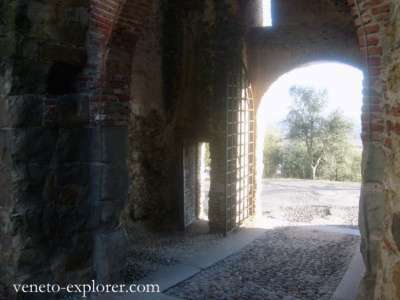 The upper castle of Marostica: a walk amongst olive trees groves and conifers. 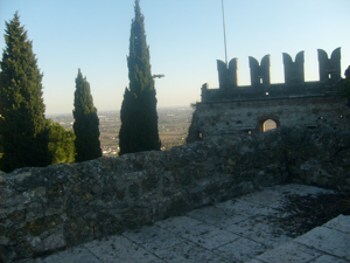 Most of the upper castle was devastated in 1510, as mentioned above. Even if in Veneto there are medieval towns and villages with better preserved castles, it is really worth your while going for this walk. You can reach the upper manor by car, by taking the road on the northern side of the hill – you might want to do that if you’re hungry too, given that there is a restaurant up there! Or, and this is the most picturesque and healthy way, you can go by foot. And yes, please, take my advice and go by foot if you have the chance. The trail, called Sentiero dei Carmini (Carmini trail), climbs up in the sunny southern part of the hill, the one visible from the square. The round trip will take you about 1,30-2 hours.Do not forget to wear comfortable shoes, as the trail slopes up steep, and it’s partly covered in cobble stones and dirt. Let's begin the walk to the upper castle! 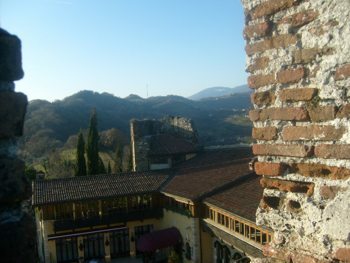 The Marostica area, above all the Pauso hill, is quite interesting as well from the natural point of view. You will notice that the trail stages leading to the upper castle are marked out with botany and geology information signs. 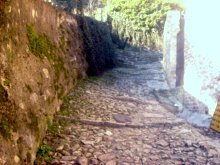 While climbing up you will notice a lot of stones and rocks on the ground, also used to build the little dry stone walls along the path. In the past they planted many ornamental evergreen trees, like the common mediterranean cypress (with its very recognizable and unique narrow and stretched shape, common in many areas of Italy and of other mediterranean countries), the Arizona cypress, pines, cedars. Almost at the top of the hill. You will see a lot of trees not planted by man, mostly the bagolaro (celtis australis), and then elms and yoke-elms. The bagolaro is a very elegant shaped tree, very common in all of Italy, often planted in the old villas gardens. It grows best in the mild mediterranean climate, and this proves the mildness of the climate in these sunny slopes. 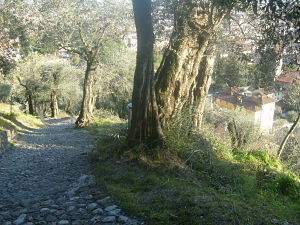 In fact, just like the olive trees, it does not grow on the north facing side of the hill. You will see here and there some tufts of caper, and this is really rare in Veneto and north Italy, while it’s very common in the milder climate of the South. Unfortunately it remains precious little of the imposing main keep, of the many rooms palace, drawbridges and windmills. But you will like to walk along the crenellated ramparts, enjoying the astonishing 360° view over the plains southwards and over the mountains and the Asiago plateau northwards. To go down the hill, you can go back on the same trail or walk on the asphalt road, in the more shady north-western side. Along the way you will find a small local birds museums (non caged living birds). Here in the northern slope the landscape changes dramatically: from mediterranean to pre-alpine, with lush woods of chestnuts, elders and oaks taking advantage of the less dry ground. Getting further down in the eastern slope, the landscape turns again into something different: fields, vegetable gardens, some vineyards and cherry trees. The Marostica area is renowned for its cherries..if you love blossom trees, the spring here is spectacular. From Milan : take the A4 highway direction Venice, exit in the A31 highway "Valdastico", direction Piovene Rocchette. Exit in Dueville and take the State Road 248 direction Marostica. From Trento: take the State Road 47 direction Bassano del Grappa, then Marostica. Like in most medieval towns and villages, fortunately only the residents living in the city centre can drive inside. But in Marostica there is no lack of parking lots, and it will take you minutes to reach the historical center.